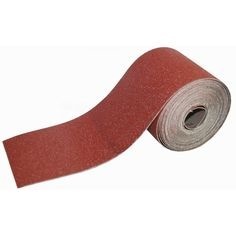 SANDPAPER ROLL PKE51- 4" X 50M is rated 4.0 out of 5 by 1. Rated 4 out of 5 by all_repair from Big roll. Strong I bought the G180, smallest grid. Very strong, I use it mainly to sand plastic, don't seem to wear off at all. The roll is big for my occasional use. Personally better than those A4 paper size which I need to cut, this I just tear to length.